Chapter 3 extract: Bishopshire – I gave up smoking in my mid-thirties so steep ascents generally don’t usually leave me gasping. Bishopshire is an exception, not so much a golf challenge more a cardiac stress test. Opened on 11th April 1903, the 22 acre site was originally rented from a Mr Small for the grand sum of £5 each year and eventually purchased outright in 1923 for the princely sum of £470. This is an odd and imaginative place for a golf course, similar in length to Allendale, it adopts the same strategy for protecting itself, not so much laid out as carved into the hill side. Strathtay: The fifth, 203 yard par 4 is unique; Spion Kop is a serious challenge. Played back up the hill from inside the copse, what faces you from the tee appears to be a near vertical grass bank with a marker post at its summit. The name reflects the terraced nature of the hill and pays homage to Captain Steuart’s first-hand experience of the Boer War and the infamous defeat of the British at this strategic hill near Ladysmith, South Africa in 1900. The name has been used at sporting venues since the early 20th century, the first recorded reference relating to Arsenal’s Manor Ground in 1904 when a local reporter likened the silhouette of fans standing on a newly-raised earth bank to soldiers standing atop the hill at the Battle of Spion Kop. 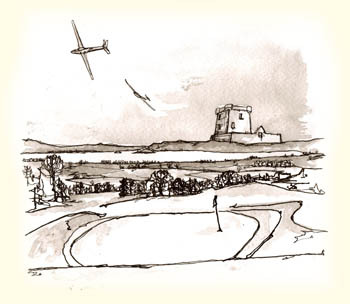 The drawing depicts the view from the 7th tee at the top of the course with the ever-present gliders circling above Loch Leven and Castle Island. A life time of technical writing, an unhealthy interest in speed and a passion for golf have finally coalesced. The author has found his real voice in the pages of this book; a journey into his past played out across golf courses in wild places to the distant echo of racing engines. Golf in the Wild is licensed under a Creative Commons Attribution-NonCommercial-NoDerivatives 4.0 International License.